The Silver Market will experience a significant trend change in the future due the unraveling of the paper markets. Already we are witnessing a lot of political turmoil and havoc as President-elect Donald Trump gets ready to take over the White House in the next few days. It’s also logical to assume the policy changes President-elect Trump wants to make will cause serious ramifications to the highly leveraged debt-based fiat monetary system… whether he realizes it or not. Craig over at TFMetalsReport.com recently interviewed Paul Myclhresst about the huge problem the Chinese government is dealing with as they liquidate Dollars to prop up their banking and economic system. I highly recommend listening to that interview if you haven’t. As we can see from Hugo’s chart above, countries continue to liquidate their official reserves (mostly U.S. Dollar reserves) to prop up their financial and economic systems. This is a very BAD SIGN… likely to get much worse in the future. Let me explain this chart as it contains some interesting trend changes. First, the majority of annual net surpluses occurred from 1975-1987. This was after the U.S. and British Govt’s colluded to start the Gold & Silver Futures trading markets, which funneled investors funds into paper precious metals rather than physical. You can read more details on this in my article, PRECIOUS METALS INVESTORS: Are You Ready For The Great Financial Enema. This was also the same time when governments and big investors were dumping old silver coins onto the market that were no longer being used as currency. You will notice that in 1978 the net silver surplus was very low. This was due to the huge demand by investors as the price of silver skyrocketed. However, as the silver price was capped by the “Financial Doctors” at the Fed and CME Group in 1980, many investors dumped silver back into the market. 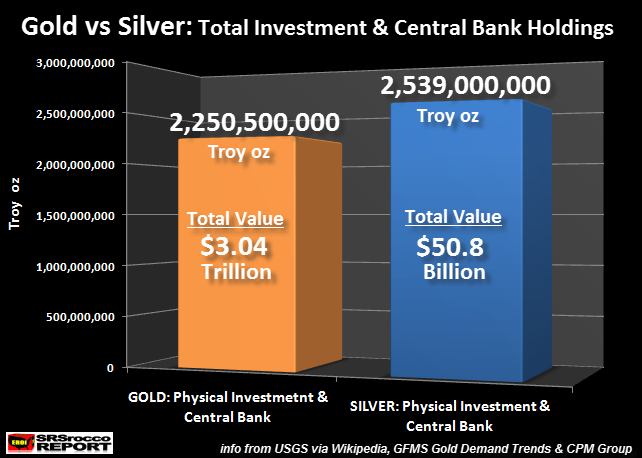 According to GFMS’s data, there was a 306 million oz (Moz) surplus of silver that year. And, as the silver price continued to decline in the 1980’s, more silver was dumped into the market, especially in 1983 (140 Moz) and 1984 (149 Moz). I don’t want to get into too much detail from years 1987-1999, but annual net surpluses continued as governments such as China, Russia and India sold official silver stocks into the market. 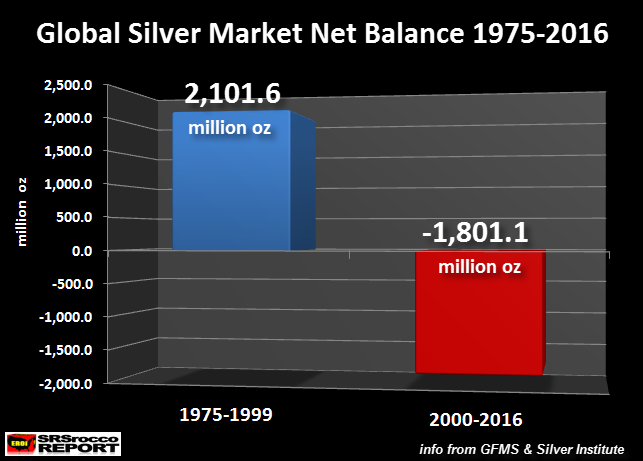 But, this all changed in 2000 when the Global Silver Market started to experience net deficits. 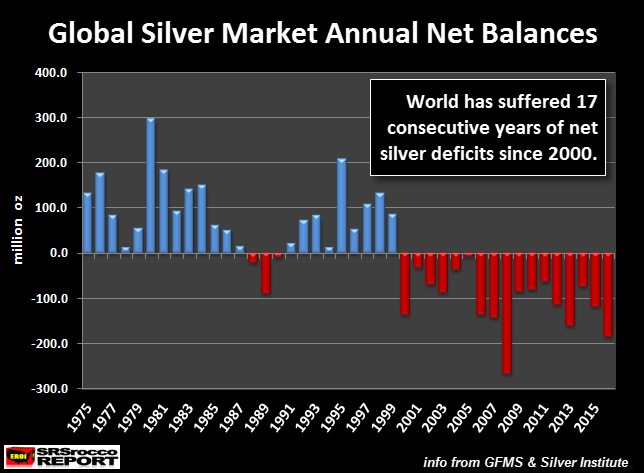 And… since 2000, the Global Silver Market has experienced 17 consecutive years of net silver deficits. According to GFMS and the Silver Institute, the world will suffer another 185.5 Moz net deficit in 2016. Of course these figures are best estimates and do come from an official source that may have the motivation to under-report the real situation, but we can clearly see that a lot of silver has moved out of the market and is now likely be held by extremely tight hands. While the market is nothing more than one huge “Intervention”, these official figures reporting 17 years of consecutive net silver deficits means the silver market is poised for something extremely big. And, I am not saying that just because I am a silver investor. The PROOF is right in front of us. No need to hype something that is totally making the CASE for us. 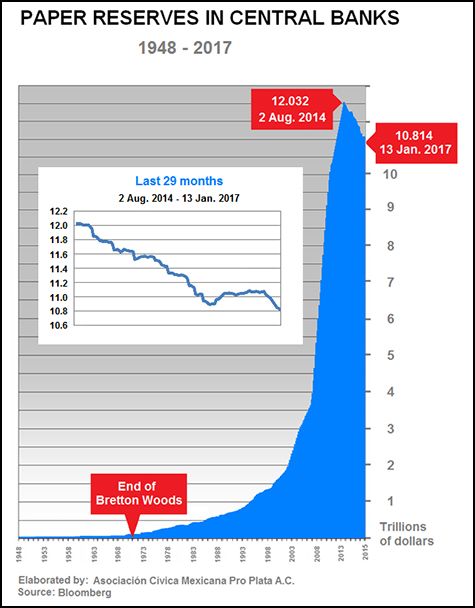 While many precious metals investors believe that market intervention and manipulation can continue indefinitely, we are already witnessing the collapse of International Reserves. Furthermore, if President-elect Trump is allowed to run the White House for a while, we are going to see serious financial dislocations due to trade wars and increased U.S. inflationary pressures. In addition, GFMS and the Silver Institute forecast continued net annual silver deficits for the next several years (at least) as global silver production declines while demand continues to be strong. This will be just more FUEL for the SILVER MARKET FIRE ahead. Again, this is not hype. What I am explaining here is the same setup as those characters portrayed in the movie the BIG SHORT, who were betting against the disaster called the Mortgage-Backed Securities industry. They knew it was a huge house of cards ready to implode… it was just a matter of time. According to the best sources I could come across, there is about 2.2 billion oz of investment gold and 2.5 billion oz of investment silver in the world today. Of course, there is likely more physical gold and silver we don’t know about, but it will not change the ratio all that much. That being said, just a doubling of physical gold and silver demand will put a lot more pressure on the silver price than gold as big traders and hedge funds jump aboard for larger percentage gains. As we begin to see fireworks going off in the United States as President-elect Trump stirs up the pot, 2017 will likely be the year things really start to fall apart. If you haven’t read my article, PRECIOUS METALS INVESTORS: Are You Prepared For The Great Financial Enema, I provide more clues of the situation ahead.